However, it was recently pointed out to me that since a high fraction of UK mortgages track the Bank of England’s base rate, a jump in rates, something we’d expect as soon as UK economic growth is back on track, could make mortgages much less affordable, clamping down on the demand for housing. This didn’t chime with my instincts—it would be extremely costly for lenders to vary mortgage rates with Bank Rate so exactly while giving few benefits to consumers—so I set out to check the Bank of England’s data to see if it was in fact the case. What I found was illuminating: despite the prevalence of tracker mortgages the spread between the average rate on both new and existing mortgage loans and Bank Rate varies drastically. Banks and building societies offer two main types of floating rate mortgages: standard variable rate (SVR) and trackers. Trackers usually follow the BoE rate closely. 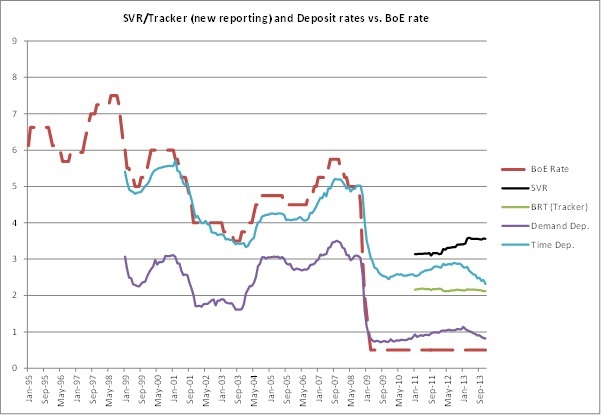 SVR are slightly different: margins above the BoE rate are more flexible. Banks vary them to manage their revenues but usually fix them for an extended period of time before reviewing them again. During the crisis, some banks that had vowed to maintain their SVR at a certain spread angered their customers when this situation became unsustainable due to low base rates. Some banks and building societies made losses on their SVR portfolio as a result and had to break their promise and increase their SVR. but what is clear is that tracker mortgages be damned, interest rates are set in the marketplace. I think this is widely exaggerated. Ben missed something crucial here: banks have fixed operational costs. Banks generate income by earning a margin between their interest income (from loans) and interest expense (from deposits and other sources of funding). They usually pay demand deposits below the BoE rate and saving/time deposits at around the BoE rate, and make money by lending at higher rates. From this net interest income, banks have to deduce their fixed costs (salaries and other administrative expenses) and bad debt provisions. It is clear that banks started to make losses when the BoE rate fell, as the margin on the floating rate back book (stock) became negative. Using the new BoE reporting would make those margins look even worse*. To offset those losses, banks started to increase the spread on new lending, leading to a spike on the interest margin of the front book (green line above). Banks can potentially reprice their whole loan book at a higher margin, but this takes time, especially with 15 to 30-year mortgages. 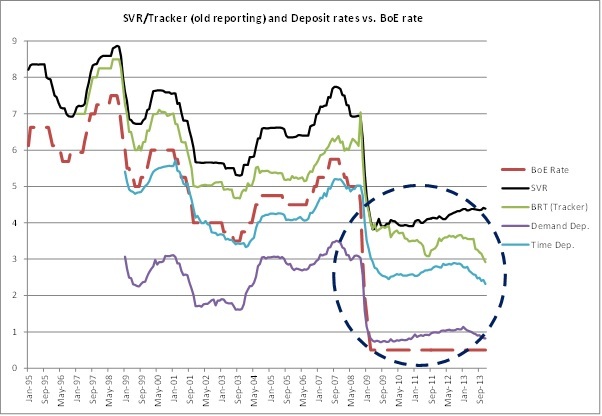 Consequently, banks not only increased the spread on new lending, but also decided to break their SVR promises and increase their back book SVR rates (see black line in charts). This usually did not go down well with their customers, but some banks had no choice, having entered the crisis with too low SVRs. What happens to a bank whose net interest income is negative (assuming it has no other income source)? It reports net accounting losses as it still has fixed operational expenses… Continuously depressed margins explain why banks’ RoE remains low. For banks to report net profits, their net interest income must cover (at least) both operational expenses and loan impairment charges. 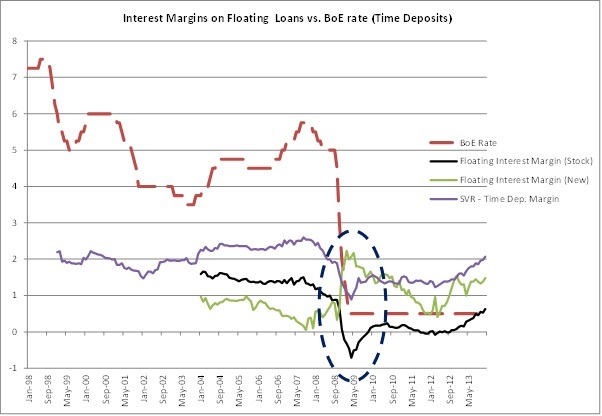 What Ben identified as ‘market-defined interest rates’ or the ‘spread over BoE’s rate’ from 2009 onwards is simply the floor representing banks’ operational costs, under which banks cannot go… The only other (and faster) way to rebuild banks’ bottom line would be to increase the BoE rate. A mystery though: why didn’t banks decrease their time deposit rates further? I am unsure to have an answer to that question. 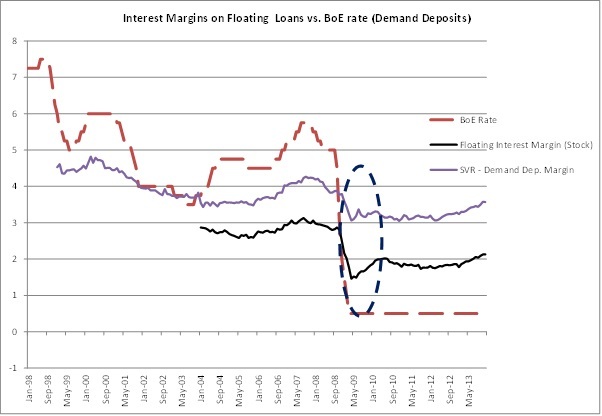 A possibility is that the spread between demand and time deposits remained the same. 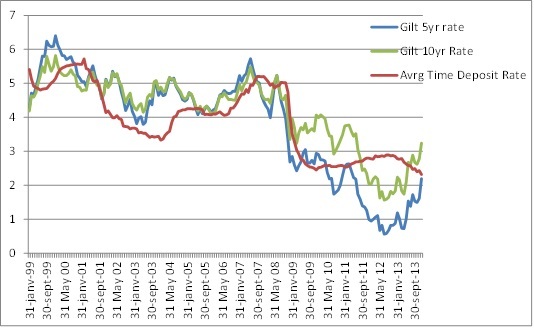 Another possibility is that banks’ time deposit rates remained historically roughly in line with UK gilts rates. Decreasing time deposit rates much below those of gilts would provide savers with incentives to invest their money in gilts rather than in banks’ saving accounts. What would a rate hike mean? Ben thinks it would have little impact, probably because the spread over BoE seems to show quite a lot of breathing space before the base rate impacts lending rates. I don’t think this is the case. A rate increase would likely push lending rates upwards on bank’s back book (i.e. banks are not going to reduce the spread in order to maintain stable mortgage rates). Why? Banks’ net interest margin and return on equity are still very depressed. Moreover, new Basel III regulations are forcing banks to hold more equity, further reducing RoE. Consequently, banks will seek to rebuild their margin and profitability, making customers pay higher rates to compensate for years of low rates and newly-introduced regulatory measures. Update: I replaced ‘ceiling’ with ‘floor’ in the post as it makes a lot more sense! Update 3: …and I replied there!